Great Brak River derives its name from the brackish taste of the water from the two Brak rivers - the lagoon mouth is divided into two sandy channels with a small island between them. 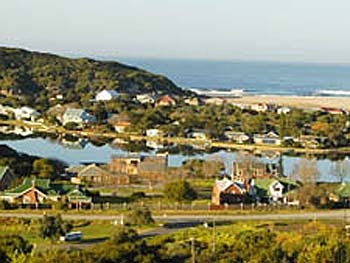 The town originated in 1859, when the tender for Keeper of the Toll Bridge at Great Brak River was awarded to Charles Searle, an English paper-mill hand who emigrated to the Cape from Surrey with his wife and four children. His elder brother Richard was originally a laborer and emigrated to South Africa to work for the Central Road Board in 1850 following a sea voyage of 68 days. At that stage the toll bridge consisted of a toll-house, a small boarding house called Ferreira's and a farmhouse on the Mossel Bay side of the river. The Searle family prospered and soon their business expanded to include shops, accommodation, a tannery, shoe-making and timber businesses in the village, which was in turn shaped by these enterprises. Their boarding house known was known as the Temperance Hotel, as the Searles were staunch abstainers from alcohol and expected everyone else in the village to follow suit. 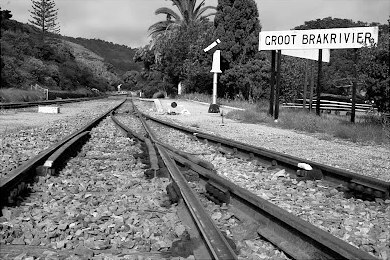 From the outset, therefore, they opposed the sale of liquor and, in time, Great Brak River became known in the neighborhood as "Prohibition Village". The 1904 census indicated that Great Brak River had a population of 362.